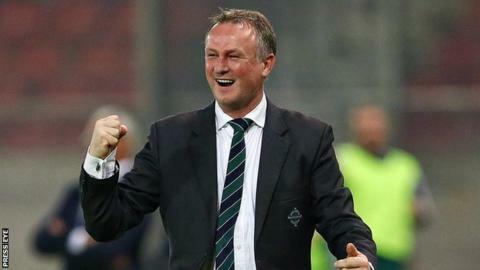 Michael O'Neill has admitted that he had doubts whether he was ready for international management before he accepted the Northern Ireland job. O'Neill also told BBC Scotland false rumours he had a drink problem ended his hopes of becoming Hibernian boss shortly before he took the Irish job. "Had a job in Scotland been offered to me prior to the international job, I would have taken it," said O'Neill. "I didn't think I was ready at 41 years of age to be an international manager." But weeks before accepting the Northern Ireland job, O'Neill had thought he was in the frame to manage one of his former clubs Hibernian. His friend and St Johnstone chairman Geoff Brown, who was searching for a new manager for his club, informed O'Neill of the false rumours that he had a drink problem. "Geoff said to me, 'look, there are people saying things about you that I don't believe are true and it's only fair you know'. "I was appalled to hear that. Yes, I'll go to the pub and have a beer, of course, and I always enjoyed as a player being around my team-mates, but I don't think anyone would ever say that I was a poor professional as a player. "The other thing about it was that I was commuting from Belfast to Dublin. It was virtually impossible for me to have a drink problem, I spent most of my time in the car. "I have a fair idea where that came from - you find things out. It came initially out of Ireland from someone who was trying to help someone else get a job. "At the time, I had a Dublin-based agent, Fintan Drury, who was quite a powerful man in Irish sport and he tackled it with the people in question." O'Neill took on the international job after a period during which several Northern Ireland-born players had opted to switch allegiance to the Republic of Ireland. Portadown-born O'Neill says he had to deal with media speculation that his Catholic background had helped him get the Northern Ireland post. "I remember being asked, 'do you think you've got the job because you're Catholic', and I said, 'I'm not here to say Mass, I'm here to pick a team and hopefully my achievements at Shamrock Rovers are the reason I got the job'. "I wouldn't say it was a major factor, but it might have been in the Irish FA as a contributing thing to change how the organisation or the team was perceived. "I only ever wanted to play for Northern Ireland. I grew up wanting to play for Northern Ireland. "I was in the squad with [other Catholics] Neil Lennon, Gerry Taggart, people like that, Michael Hughes, Jim Magilton - we had loads of Catholics in the squad at that time and we all mixed fantastically well." O'Neill said that he met Derry-born James McClean in an attempt to convince him not to join the exodus to the Republic. "The Republic of Ireland's focus is obviously on the Catholic players who would be perceived to be from a nationalist background. "In the three years, we haven't lost a player, apart from one or two at under-16, under-17 that have made that choice." O'Neill believes a number of Northern Ireland-born players who have opted for the Republic will end up with reduced international careers. "Eunan O'Kane, who plays for Bournemouth, he's a very good player, he played for us at under-21. He elected to go with the Republic of Ireland and the competition for places is greater there than it is for us. "Eunan O'Kane would be in my squad now. He'd be going to France but he makes Martin O'Neill's 39-man squad but he's not progressed as he would have progressed with us." How far can Northern Ireland's new heroes go? Read more on How far can Northern Ireland's new heroes go?